Nicole Claire looks at a collection of short stories for young adult readers. My True Love Gave to Me, edited by Stephanie Perkins; St. Martin’s Press, $18.99, 321 pages, ages 12 and up. Looking for a beachside novel to tote to sunny locales during your winter getaway? Pulitzer Prize finalist Lydia Millet (Love in Infant Monkeys) delivers something slyly different from the usual cabana literary fare. The book starts with a traditional honeymoon narrative: newlyweds Chip and Deb disembark at a gorgeous Caribbean island, fully prepared to do nothing more than bask in the sun. Instead, they meet a marine biologist who has recently discovered a group of mermaids living off the coast. After the discovery goes public and hoteliers try to capitalize on the find, there’s no more quiet vacation for the lovebirds. Murder and intrigue soon follow in this quick-witted, fast-paced satire. Millet’s wonderfully dark, surreal story manages to address the serious topic of misusing natural resources with verve and biting wit, while straddling a few literary genres at the same time. Allow yourself to get lost in this frothy frolic. POP–UP NEW YORK. Copyright © 2014 by Jennie Maizels. Reproduced by permission of the publisher, Candlewick Press, Somerville, MA on behalf of Walker Books London. The image of the Flatiron Building is a tradmark used under limited license. The Empire State Building image ® is a registered trademark of Empire State Building Company LLC. and is used with permission. Pop-up New York, by Jennie Maizels, Candlewick Press; $19.99, 12 pages, all ages. Forget the ubiquitous I LOVE NY tee shirts because there’s a better way to show your love for the Big Apple that also makes a great holiday gift; Jennie Maizels’ latest oversize pop-up book dedicated to New York. 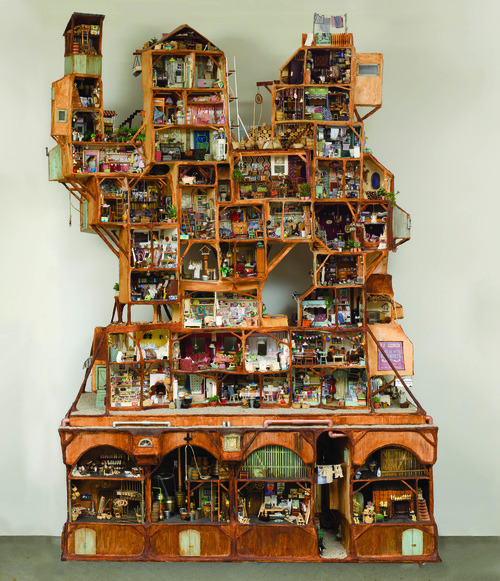 (London was the object of her previous pop-up ode to urban life.) Here readers are treated to marvelous paper engineering showcasing many of the places that make New York unique, such as the Statue of Liberty, the Empire State Building, Yankee Stadium, and the High Line. Each oversize page is filled with fact-filled flaps for further exploration. Where many pop-up books of this size and scope can cost close to thirty dollars, Pop-up New York delivers great value as a statement-making present and can be found for less than $20. If you can’t make it to New York this holiday season, bring it home instead – there’s no place like it. This mansion isn’t for ritzy city murines; it gives off a warm, nubby, cozy feel, and the accoutrements appear pulled from a romp through an attic that hasn’t been touched since 1970. 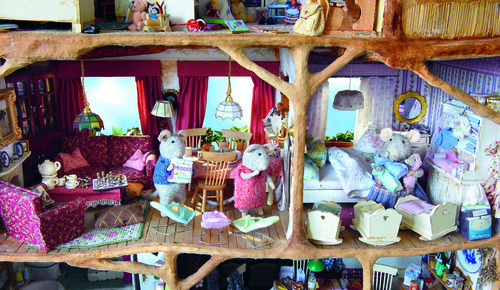 Families of gray and white cloth mice live here, and two young friends, Sam and Julia, scamper from room to room in search of adventure and fun. There’s laundry to sort, a bakery to visit, and even a Friday night Sabbath to attend, complete with a tiny table covered by challah, candles and wine. Schaapman’s detailed artwork is accompanied by thoughtful and informative text, and though the book clocks in at 60 pages, each chapter can easily be read as a unique tale. Pouring over the abundant detail on each page will captivate readers of all ages, and makes an excellent reading choice for snuggling up and spending a wintry afternoon with little readers. image©2011 Karina Schaapman, photo by Ton Bouwer. Reproduced with permission from Dial Books.